I'm just going to go ahead and say it: Worst. Year. Ever. (Well, not exactly the worst- I mean, we did just move into a beautiful new house and I've got a six month old (how crazy is that?) and a four year old who just started soccer (and is very excited about it) and a beautiful wife that I love and adore.) But seriously: first Bowie and now Prince? I didn't come of age in the 80s, so I wasn't deep in the MTV generation, but I was old enough in the early to mid-90s to dig me some VH1 and Prince videos tended to pop up (pun intended) a lot on Pop Up Video. 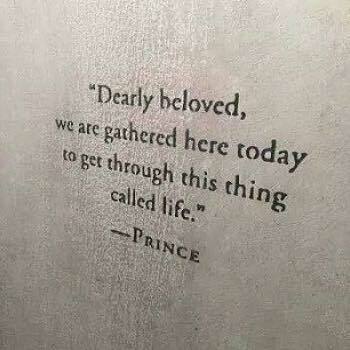 I remember the video for Raspberry Beret and Kiss- and then of course, Baz Luhrmann's Romeo + Juliet was my first introduction to When Doves Cry, but it wasn't until I moved to Minnesota for grad school that I really began to understand just how big of a deal this dude was. Every bar I ever went to in Minnesota (and believe me, I went to many) you heard Prince. At some point in the night, you always head the dude. It was like a box that needed to be checked off: Surly or Summit Beer on tap, Twins/Wild/Vikings/Gophers game on the television and Prince somewhere on the jukebox. It seemed like a strangely incongruous fact about the Medium White North that it produced Prince. I mean, Bob Dylan makes sense in a weird sort of way: white dude, guitar, harmonica, travelling troubadour type of deal- walking around the cornfields and singing about life and all that jazz- it fits. But Prince? The supernova of purple badassery? From, of all places, Minnesota? It seems like something you never would have guessed but should have really expected- which sort of fits the man, to me. The world lost a staggering genius and a once in a lifetime talent today. But don't read any more of my words: see for yourself. The world is turning purple tonight to remember the life, the music and the genius of a one of a kind artist, who could play the hell out of a guitar and rocked the faces clean off of an entire generation. His face belongs on the Mount Rushmore of contemporary pop culture for than just his music. He changed the game. He changed everything. And now we have to live in a world without Prince. And if that isn't a heartbreaking loss of a staggering genius- I don't know what is.